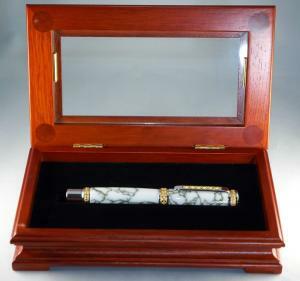 "The box really ups the value of any pen placed in it. This is now a standard accompaniment with every pen I sell. Inserts are available for larger pens, but the one that comes with it will hold just about any regular pen aside from the slimline." "Ordered this as a request by customer after he saw the image from PSI. Turned beautifully and easy to work with." 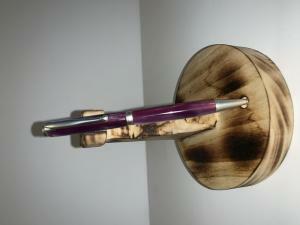 "very attractive stand to add that little extra to your pen display"
Cute novelty pen, but hard to write with. 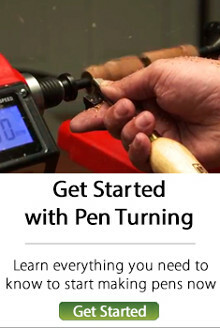 "I love the look of the finished pen, and it's extremely easy to turn, but the final product is a bit hard to write with. 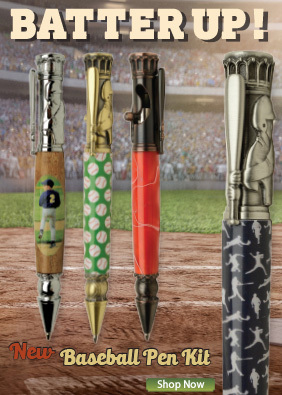 A nice novelty pen amidst a sea of novelty gun and bullet pens. Nice to have something for the car or bike enthusiast." "Made this with a funline satin silver kit!" "This is my best seller. I make it with cholla cactus with turquoise dust filling the gaps, use a CA finish and it sells quick. 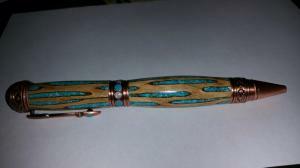 Everyone who buys the pen love it." 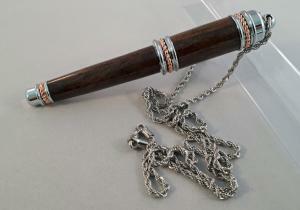 "Just the thing for the sports lady who would like a bullet pen, but doesn't want one a big as the standard. 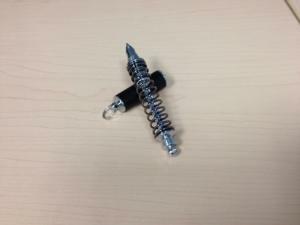 The pen kit is easy to use and lives up to the high PSI standard. 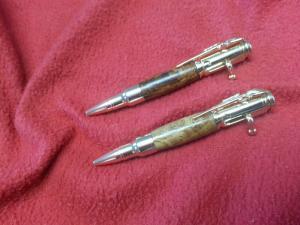 I made one from a Bois 'd Arc root and another with Oak Burl, both in gold shown in the attached photo - both as gifts. Bois 'd Arc, also known as Osage Orange, horse apple or hedge apple, is a beautiful wood and easy to work with a lathe, but death on saws. Indian tribes planted it all around the Great Plains to have a source for their bows. Fence posts made from this wood last well over 100 years. The Oak Burl is not bad either. Both came from my farm in East Texas. You can buy Bois 'd Arc from Argentina, but it's not nearly as pretty as the North American variety." 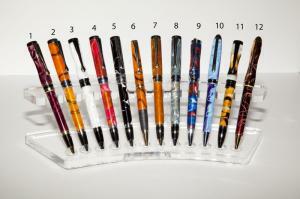 "I used the single pen stand to display my "Pittsburgh Swirl" pens on my web site. I am pleased with them." "nice result but you need to follow the instructions fully and be precis with measurements. Chain goes on with a bit to twisting and manipulating. Be careful not to use pliers as they will twist the link." "Another very cool looking Rhino blank." Great pen. Threads are a weak point. "It's a great kit all around. People love it. But the threads are still a weak point on this one. Fragile and prone to breaking at that spot within a year, even if you follow careful instructions and assemble without putting any pressure on them. Other than that, though, I've had great luck with this one." "If you know what you are buying, it is a great razor stand. Please read the dimensions to know if your razor will stand nicely. Certain razors have very short handles that are too short for this stand (many vintage Gillette's for example have very short handles). 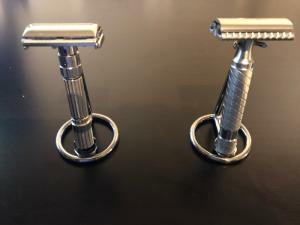 Any handle shorter than a Gillette Fatboy is too short (see attached picture with the Fatboy on the left and Timeless on right. If you have the correct length of handle, this stand is perfect and a great value. My Fatboy and Timeless SS 80mm barber poll handles fit great."